I read recently that some children do not leave home until 27 years of age. Although this has less to do with protection and more to do with finances, spare a thought for the child sailors of the 18th & 19th C. It will comes as no surprise of course to anyone who read the stories of Horatio Hornblower or watched that fine movie Master and Commander. But the Royal Navy had very marked shortages in crew, particularly at time of war. Boys as young as 12 were recruited, often as a means of escaping poverty, others as a means of punishment or reform, to fill various roles aboard ship. These roles included servant boys, cabin boys, carpenters mates, and, what I have read was the worst job in the navy, a Loblolly boy - surgeons mate. The navy was also a career of course and the families of the middle classes also sent their boys to become midshipmen who through study and experience might enhance their opportunities. A phrase used to capture the lot was Younkers. The life of the younkers was a mixed one no doubt, and probably very much depended on their posting and those given charge of them. But there were opportunities for advancement and the greatest Master and Commander of the era, Admiral Nelson started life as a twelve year old midshipman. We also had a midshipman from our locality, Henry Bolton. I'm not sure if we can say his career was typical, but it is certainly interesting. He first saw action during the Napoleonic wars, when the Royal Navy in alliance with the Austrians tried to cut off the French fleet at Flushing and invade the low countries. The so called Walcheren Campaign was a disaster from start to finish and saw the deaths of 4000+ British troops, the vast majority from illness. Henry survived however. 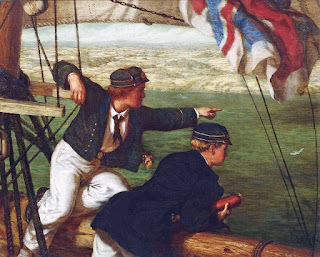 He next saw action in the Mediterranean, and finished off his stint with the ship when during the war of 1812 declared by America against the British. His ship limped back to home following a grounding incident while trying to blockade American ships in the Elisabeth River and he was transferred to the HMS Tiber. He served on the Tiber from 1814-1815. 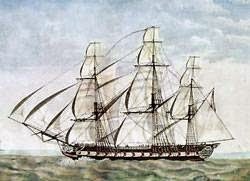 He joined the HMS Opossum in Arpil 1815, a Cherokee class Brig which saw service in the Channel and the North America Station. He served under Commander John Hay, who would later to rise to a position of rear Admiral. 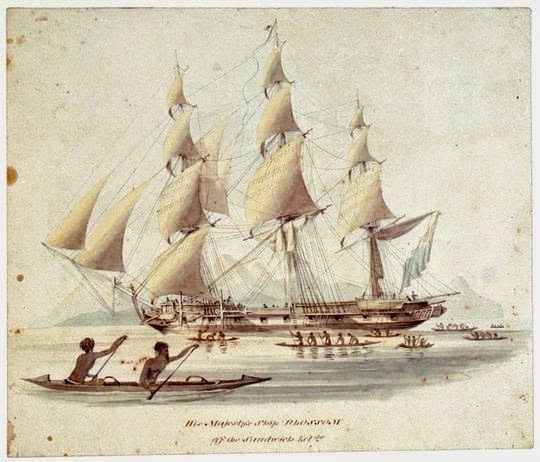 His next ship was the Sloop, HMS Blossom, on which he served between 1818 -1827. The Blossom was involved in extensive surveying of the pacific Islands and extending the British dominion wherever she sailed. Bolton must have had many adventures and stories to tell. His last ship was the HMS Thetis, a 46 gun 5th rate Frigate. He joined the ship in 1827 in a senior position and served aboard her until August 1830 at which point he got an appointment ashore at Waterford. He was fortunate. 4 months later on the 4th of December the Thetis was wrecked at Cape Frio on the South American Coast. The wreck was a major embarrassment to the Navy and both the captain and master faced a naval tribunal due to miscalculating the ships position. The ship was only a day out of Rio when she drifted ashore. She was later lost with 25 souls, (although 275 men and boys survived) but it was the cargo that was the biggest talking point. She was carrying gold bullion and coinage estimated at the then value of $810,000, collected from taxes and trade. Meanwhile Captain Bolton was most probably looking forward to a Christmas ashore, in his new position of Inspecting Commander of the Coast guard at Waterford. He served two terms and following his marriage in 1839 to Ann, only child of William Kearney of Waterford they settled into civilian life, spending some of it at least at Ballinlaw, above Cheekpoint on the River Barrow. He died on May 30th 1852, having seen most of the world, despite the fact that he didn't have a TV or the Internet. He was buried in old Faithlegg Church with his father. I took all of the information about his Naval career from the following naval biography and a further piece here. For more on Henry Bolton see Julian Walton's On This Day, Vol II. published in 2014 pp152-53. What a great way to start a day Andrew. I look forward to your blogs, never knowing what piece of local history I might learn about. Cheers.